These healthy wraps are similar to those served at your favorite coffee chain. Cooked quinoa, black beans and corn are piled high on wheat wraps and topped with pepper jack cheese and a spicy lime mayonnaise. I have a habit of frequenting Starbucks. Probably too often! On one of my stops, I was browsing the menu while waiting and saw they offered a black bean quinoa wrap. I quickly ordered it and realized I could easily make this at home. 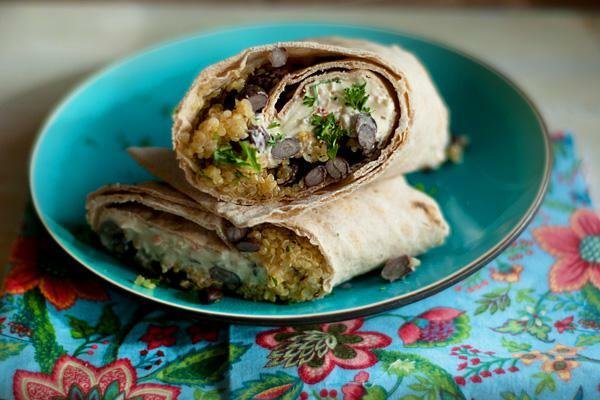 The wrap was vegetarian and filled with a mixture of cooked quinoa, corn and black beans. It was toasted, served warm and was very filling and delicious. Here is my recreation of this delicious wrap. In a medium pot over medium-high heat, add the quinoa and the vegetable broth. Cook the quinoa for about 10-15 minutes, stirring frequently or until all of the liquid has evaporated. Once cooked allow to cool. In a bowl add the mayonnaise, lime juice and all of the seasonings, mixing well. To the pot of quinoa add in the corn kernels and the black beans gently tossing to mix. Divide the quinoa mixture between the 4 wraps and top with the shredded pepper jack cheese and a dollop of the mayonnaise mixture. Tightly roll each wrap in plastic wrap and chill for several hours or until ready to eat. To prepare the wraps heat a skillet over medium heat and spray with nonstick cooking spray. Toast each wrap until the outsides are golden brown and it’s completely heated through. Cut in half and serve.